This is quite a common setup for Fibre TAPs. However, there was the phenomenon of a 10G analyser which was only able to detect a link when the plug was wiggled slightly. That was exactly the problem. No reliable connection to the analyser could be established, although the connection between the server and the switch remained stable. Through a simple Optical Power MeterDevice, I managed to measure the following values and with the help of some datasheets, I managed to restrict the problem. 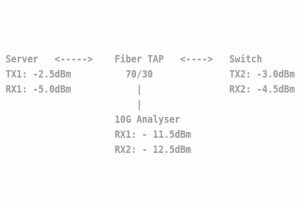 According to the datasheet, the Fibre TAP had a -2.1dB loss on the network site (the connection from the server to the switch) and -6.3 dBm at the monitor port (to the 10G analyser). The Receiver Sensitivity of the deployed SFP+ SR Transceivers was of -12.0dBm, causing RX2 to run outside its specification. This explained why the link to the analyser was unreliable. The result is highly unsatisfactory! If you do your maths, you are able to see from the analyser that a theoretical RX level of approximately -9.8dBm can be achieved (TX2 -3.0dBm + Monitor-Port TAP -6.3dB + Pin connector-0.5dB), RX1 level of. 9.3dBm, respectively. Almost entire 3dBs less were measured on both RX analyser ports! To begin with, we swapped the transceivers on the service and switches. After this was completed, the RX levels on the analyser looked "ok" (approx. -10dBm)even though the second transceiver TX levels were comparable to the first ones used. Swapping the patch cable to that of another manufacturer had little or no effect on the measured results. The only way I can explain this phenomenon is by concluding in simple terms that the mechanical tolerances between plug-ferrule and transceiver and receiver, receptor respectively, caused this to happen. For the practical deployment this is not good news at all, -it simply won´t scale up –specially in the case of having to test all six connections at both ends to ensure a clean link. However, it is important to note that the connection should not be handled in any way, in order to avoid mistakes from creeping in. What is the minimal power budget of our SR transceivers? Answer:most suppliers´power budgets is of approximately 6dB, since the minimal TX Levels of 10G XFPs and/or SFP+ is of around -6dBm. The Maximum Receiver Sensitivity is of -12dBm-most suppliers state 11.5dBm or even -9.9dBm, although most SR Transceivers can achieve up to -12dBm. -12dBm- 6dBm gives you a power budget of 6dB. Are there any Multimode Fibre Taps with alternative ratios? For testing-purposes, I looked at the transmitting power of 1000 SR Transceivers and out of all these tested, none of them transmitted at less than -3.5 dBm. The likelihood of a power budget of 6db is rather small , since the transmitter carries with it the variance to the effective power budget of the transceiver.In practice, we should base it on approximately 8db power budget as far as 10G SR Transceivers are concerned. The receptors on the switches and servers have a Receiver Sensitivity of -12dBm. We then come to the conclusion that in practice, only Multimode Fibre TAPs with a ratio of 60/40 or 50/50 should or must be deployed. Anything else is just not practicable, causes a lot of bother since the connection to the monitoring device (to us the 10G Analyser) cannot be rendered stable. Ultimately, this was the solution. The taps with a ratio 70/30 are swapped with those with a ratio of 60/40. Disclaimer: all connectors were cleaned very nicely during the on-site installation.